It’s official: In a biannual profile study conducted by Visit Napa Valley, it was proven that people come here to appreciate the scenic beauty second only to tasting its wine. The casual visitor admiring the acres of vineyards as they cruise along Highway 29, however, might not be aware that this scenic and economic abundance is the result of decades of impassioned advocacy on the part of local residents, vintners, and farmers. 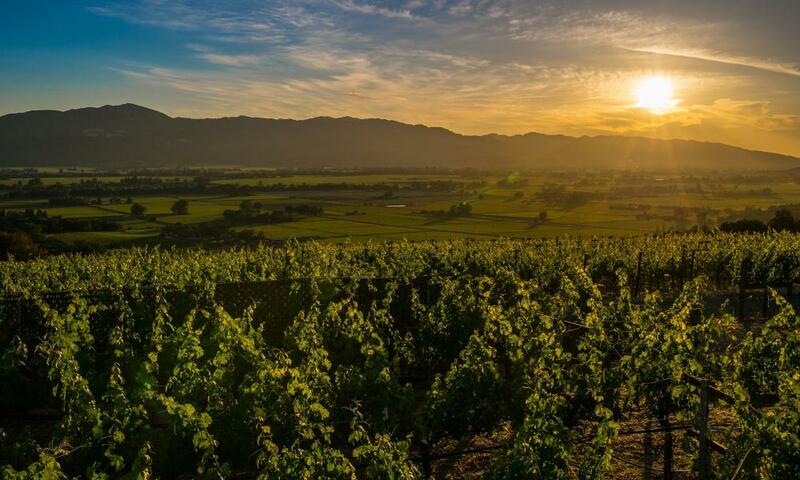 This April, the region is celebrating the 50th anniversary of its legendary Napa Valley Agricultural Preserve – the very first such preserve in the country. In the mid-1960s, local leaders and voters overcame initial dissent to prioritize agriculture as the best use of the land. The landmark ruling was passed by the Napa County Planning Commission and the Board of Supervisors in 1968. From there, the new statute inspired a succession of other progressive land-use policies to protect local farmlands from encroaching development. Today, 31,609 acres of Napa Valley Ag Preserve farmlands are protected from urbanization until the year 2058. We’re very proud of the way we’ve been able to conserve the rural spirit of this valley and, from spring through the summer of 2018, attractions, wineries, hotels, and restaurants are hosting a wide range of events to celebrate. For additional information on the Ag Preserve, you can visit its website. The Napa Valley Museum Yountville will present an exhibit, “50 Years of the Napa Valley Agricultural Preserve,” in its Spotlight Gallery. July 7 through August 19, 2018. Passengers on Napa Valley Aloft balloon rides will learn historical information about the Napa Valley Agricultural Preserve from the pilots during their flights, with key geographical markers pointed out from above. And guests who mention the Ag Preserve’s 50th Anniversary will receive a 20 percent discount on their flight. Through the month of April, 2018. Coombsville Vintners & Growers is celebrating “Grounded 2018/ Terroir Coombsville” with picnics and vineyard walks to showcase the Coombsville AVA and the importance of the Ag Preserve. Wineries hosting picnics include Sciandri, Shadybrook, Farella and Ancien/Haynes Vineyard; wineries hosting educational, interactive vintner-led vineyard walks include Porter, Marita&apos;s, Silverado Vineyards/Mount George, Dead Fred Vineyard, Covert and Favia. Sunday, May 6, 2018. Alpha Omega Winery and Beckstoffer Vineyards will team up to celebrate the occasion. Celebrated grape grower Andy Beckstoffer, who was instrumental in the Ag Preserve, and Alpha Omega’s renowned winemaker Jean Hoefliger will lead a tour and tasting at historic Beckstoffer Georges III Vineyard in Rutherford where, in 2009, 181 acres were placed under a land conservation easement that forever prohibits non-agriculture development. The Alpha Omega Foundation will donate 100 percent of tickets sold to local nonprofits to help those affected by the wildfires. Tickets are $100 per person and limited to 20 guests. Saturday, April 21, 2018. V. Sattui Winery will honor the anniversary throughout 2018 with daily educational vineyard tours, guiding guests into the heart of the winery’s organically farmed Vittorio’s Vineyard and educated on the history of the Ag Preserve. Tours include details about fish-friendly farming, organic farming, Napa Green, and V. Sattui’s many acres of conservation easements donated to the Napa Land Trust. April through December 2018. Castello di Amorosa in Calistoga will celebrate by providing information on the preserve and its impact on the Napa Valley for winery guests. A giant banner acknowledging the Ag Preserve’s landmark anniversary will also hang on the Castle’s exterior. April, 2018. Napa Valley Marriott Hotel & Spa will showcase a video about the Ag Preserve in each of its 275 guestrooms. And the hotel’s restaurant will also celebrate by creating a special Farm to Fork menu item and Grain to Glass cocktail in VIN11 restaurant. April 2018. Napa Noodles will donate corkage fees collected during April to the Jack L. Davies Ag Fund, which helps to preserve, protect, and promote agricultural land in the Napa Valley. Guests will also receive printed information on the history of the Ag Preserve. April 2018.